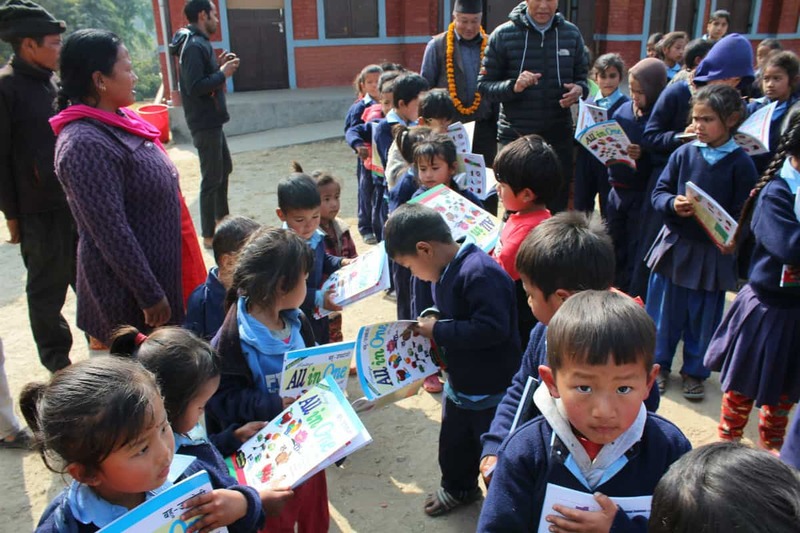 “Our work was stopped by a display of nature’s force so strong that Kathmandu is no longer the same city we knew before… We are handling the situation to our best effort, coordinating staff, volunteers, food and water. During the nights, everybody is staying at the dog centre or sleeping outside in the fields for safety. We have enough food and water for a couple of days”. It was soon to be lunch time on Saturday, April 25th when the first earthquake occurred. 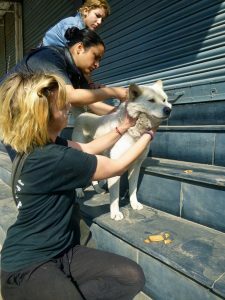 Our staff and volunteer groups were carrying out our street dog vaccination. The aim was to reach 500 dogs during that weekend, so as to fulfil our goal of 1000 vaccinated dogs in the Boudha area. Half way through, we were stopped by a display of nature’s force so strong that Kathmandu is no longer the same city we knew before. Our teams were luckily out in the streets when the ground first started shaking. Then came long waiting times, full of fear and uncertainty while bearing the many aftershocks. We went together with dogs to fields or other safe places, away from buildings and walls that menaced to crumble down. Nobody knew yet what was really going on. As the afternoon came, our teams met at the dog centre, and we could see, to our relief, that everybody was safe. Artoo (one of our centre dogs) was found by volunteer Laura while her team followed up with the rabies vaccination after the first shock. He had almost run 4km towards the river. He returned with them by taxi and is again safe with us, sharing a tent with Maya, our cook. Luckily for Artoo, Laura was there to recognise and help him… otherwise, he might have been too far to return, running away scared and confused as he was. Once we were back, we were happy to see that the house of our centre was still standing. No one had been even harmed; we were all fortunate to have survived. During later aftershocks, a wall in the quarantine area of our centre broke down, but no dog got hurt. Our clinic and several walls have cracks, a wall might fall in the main area, the cement floor is broken, but all these damages are minor compared to what happened in downtown Kathmandu or in the villages. We are handling the situation to our best effort, coordinating staff, volunteers, food and water. During the nights, everybody is staying at the dog centre or sleeping outside in the fields for safety. We have enough food and water for a couple of days. There was initially no power, and we had problems to communicate. Luckily, the power came back today for 2 hours. This enabled us to fill our water tank and charge our phones. Our staff (Sanu, Junu, Maya and Kamala) is safe. Our current volunteers Arlette Caenen, Hilke Ellen and Laura Jayo are also safe. Stupa dogs such as Fibi and Phoebe came to us seeking shelter from the disorienting situation. Strubel is fine at the Stupa and some of the other stupa dogs are there too. Whether due to injure or to hunger, we have no doubt that there must be dogs suffering in the valley. And we want to reach out and help them. We get food for the dogs from Nir, a kind restaurant owner of Boudha who gives us all of his leftovers. He is the only restaurant open in Boudha at the moment, and we are lucky to have him. Nir. He prepares a buffet for people, and everybody goes to have food there. There have been so many aftershocks that people are feeling dizzy. Everybody is both uncertain and alert, still fearing that the worse might still be coming. On the other hand, people have shown amazing solidarity. If we always thought of the Nepali as a warm and beautiful people, we are now as sure of it as we are moved. Given the dramatic proportion of the earthquake, we know we were very lucky. We send our prayers and love to the families who have lost their loved ones or who are still in painful search for their family members. We are filled with sadness and tears for this beautiful country and the great loss we have all faced. But in the face of loss, we reaffirm our will to help, especially our street dog friends who might get forgotten, but whose suffering is no less that anyone else’s. For the moment we are very busy feeding the dogs staying with us at the shelter and by checking on the ones nearby. We will try as soon as possible to get back to our Saturday camp routine and scout so as to help the doggies throughout the valley.